Nearly a month and a half into the season the Ducks have not flown as high as I had hoped this winter. But their performance has been more in line with what we had expected. The pitching staff has performed well and the offense is still finding their groove. After the 10-1 shellacking of Portland on Wednesday evening, there is some hope that the bats are beginning to settle in. If so, the offense could not have picked a better time to get hot as No. 11 Cal (18-7, 7-2) comes into town this weekend. The Golden Bears took two of three games from Oregon last year in Berkeley. Not to open old wounds, but this Oregon team is looking reminiscent of that 2015 team. The Ducks opened Pac-12 play with a 2-7 record last year and are flirting with falling to that mark again as they currently sit at No. 11 in the Pac-12. Overcoming challenges such as this however, is what makes championship teams, well, championship teams. And there is always a silver lining within a 63-game season. Kyle Kasser has emerged a consistent producer in the lineup. Kyle Kasser was inserted into the lineup against Utah and has been tearing the cover off the ball since. The sophomore’s OPS is 1.015 and his .394 avg. leads the team. 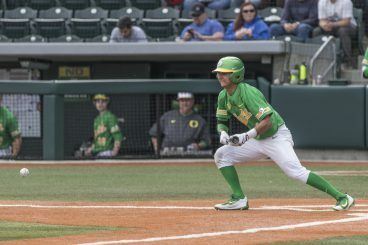 The Ducks are crawling back, posting a 4-5 record since his emergence and have scored 4.6 runs per game in that span compared to the 4.84 mark in their first 14. Jake Bennett has been similarly impressive since his first start on March 19 against Utah. His .360 avg. 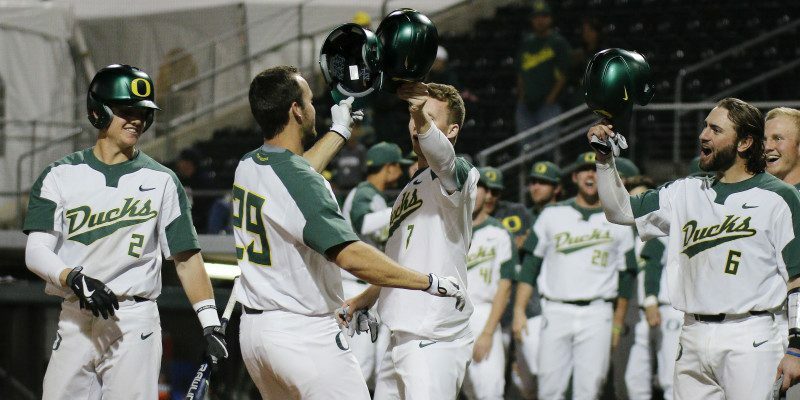 and 6 RBIs have placed him squarely in the top three in both categories for the Ducks. Of course, nothing can be certain considering the combination of a streaky offense facing off against lights-out pitching in the cavernous pitchers’ heaven that is PK Park. Oregon has their work cut out for them on both sides of the ball. Cal slugger Brett Cumberland (.410/.535/.859) is terrorizing pitchers this year and ace Daulton Jefferies (6-0, 1.29 ERA) ranks in the top three in the conference. The roller coaster ride in 2015 wasn’t an exactly fun ride, and we would all rather see a more consistent stretch in 2016. It appears that some fresh faces could spark a much needed return to their expected form. A flash in the pan is not enough to return Oregon to the pedestal they have fallen from, but it’s a start.